SID 2015 advanced and comprehensive exhibitor: BOE - Touch Display Research, Inc.
SID 2015 DisplayWeek was held in San Jose, California last week. We blogged about the SID Monday Seminar last week. Here is the summary of exhibitions at SID 2015. This year there were about 195 exhibitors at the show floor. After visit the whole exhibitions for 3 days, my conclusion is that this year one of the most advanced and comprehensive exhibitor is BOE. BOE not only demoed a 10K LCD, (see picture here), but also showed metal mesh touch screen, AMOLED display, quantum dot display and more. 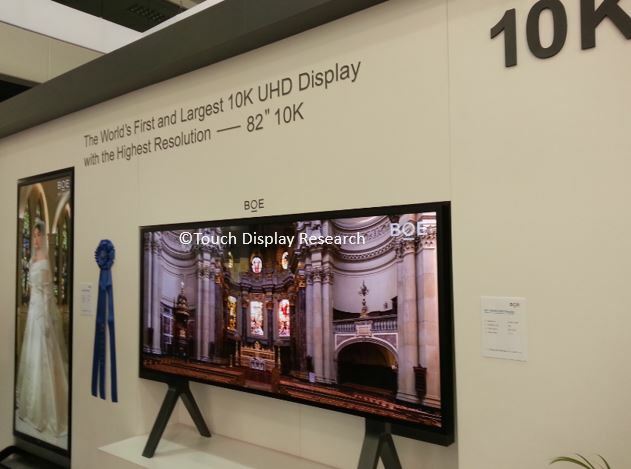 Figure: BOE 82 inch 10K display at SID 2015 DisplayWeek. The interesting thing is that Samsung is no-show at this year’s SID. In the past several years, Samsung had always put together one of the most splendid booth and showcase the “world’s first”, or “world’s largest”, or the “world’s most advanced” at SID. But at this year’s SID, Samsung completely no show, no paper. It seems Samsung is following Apple’s example: no show, no paper at SID. 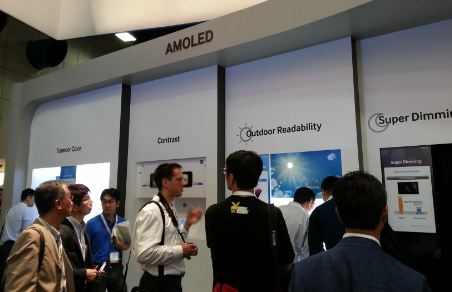 Figure: Samsung’s booth at last year’s SID 2014 DisplayWeek. More analysis about BOE, Samsung, Apple, OLED, quantum dot, metal mesh, and silver nanowire will be in the “Touch and Emerging Display monthly report”, June 2015 issue. This entry was posted in 10K, Company News, Conference Review, Displays, OLED, Quantum dot and tagged 10K, AMOLED, Apple, BOE, high resolution, metal mesh, quantum dot, Samsung, SID 2015 on June 8, 2015 by jennycolegrove.